By providing comprehensive braces and Invisalign options, we make it possible for your family to access best-in-class care in a central location, without having to visit a separate orthodontist. At our office, you’re in great hands. It’s no wonder why so many Santa Cruz, Soquel, Capitola, and Aptos area families entrust their smiles to us! We offer a variety of orthodontic services for the highest quality dental care for our patients. We encourage you to learn more about what we provide and how we can help. If you have any questions, please contact us by calling (831) 464-2424. We're always happy to hear from you! Orthodontic experts recommend an evaluation for all children by their 7th birthday. At this stage of smile development, it’s possible for us to intervene in a conservative manner so we can help your child avoid the need for surgery or complex treatments at a later age. One of the ways Dr. Konopka does this is by implementing interceptive therapies such as expanders, space maintainers, and Phase I braces. These treatments can improve your child’s natural oral development in a way that leads to better alignment of the teeth and jaw as they grow up. Do You Prefer Traditional or Tooth Colored Ceramic Braces? Ceramic or metal brackets allow us to get better results and have more control over how your teeth are moved. Dr. Konopka recommends this predictable and successful option for our patients with more moderate to severe crowding and bite misalignment. Plus, thanks to a ceramic option, adults can wear traditional braces and still not have their appliances be noticed during casual conversations. They blend right in with the color of your natural smile. Dr. Konopka has been an Invisalign provider for over a decade. Most of our Invisalign patients complete their treatment in 12-18 months. The process is comfortable and is teen-friendly. If you think you’re too old, you’re not… our oldest patient currently in treatment is in her 60s! You’ll love how your Invisalign clear braces are removable and allow easy care and the freedom to enjoy all of your favorite meals. Don’t Forget About the Boost in Self Confidence! It’s natural to feel proud of your teeth when you love how they look. Not only do you see your smile transform, you’ll notice your personality change as well. You’ll no longer have to hide your smile in photos or avoid meeting new people because you’re embarrassed. Once your orthodontic treatment is complete, we can also perform a cosmetic gingivectomy to smooth and even the gum tissues so your teeth look fuller and evenly sized. This technique is also useful for people with “gummy” smiles. It’s easy and quick, and there’s practically no recovery time necessary. 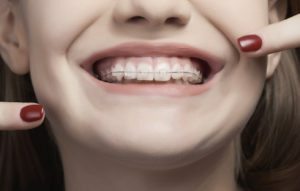 If you are ready to find out which type of braces are right for you or if you think your child needs orthodontic treatment, we’re happy to schedule a consultation appointment and answer any questions you may have. It’s time to see why so many people have trusted Dr. Konopka with their orthodontic treatment. Call our dental office in Soquel to schedule a free consultation or to find out more. Be sure to ask about our membership plan that saves you 5% on Invisalign aligners and retainers!